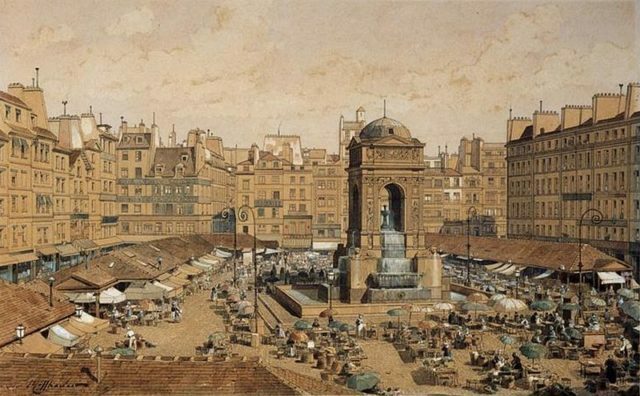 Place Joachim-du-Bellay is a famous public square near to the center of Paris and is visited by thousands of locals and tourists every day. A fountain named “The Fountain of Innocents” stands in the center of the square. 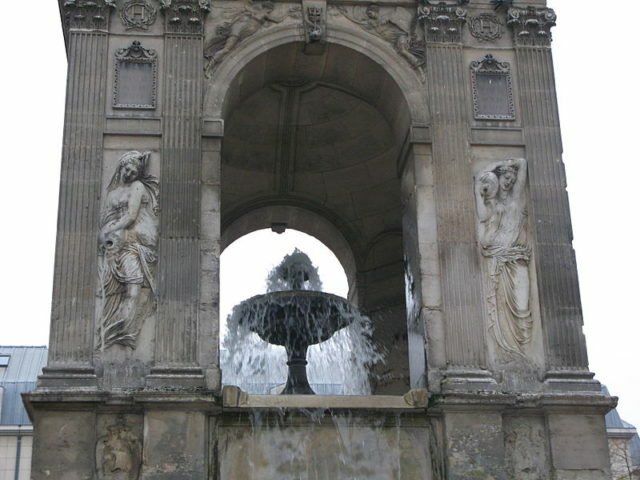 The fountain happens to be the oldest fountain in the capital of France, and its story is rich and colorful and stretches far back into the history of Paris. 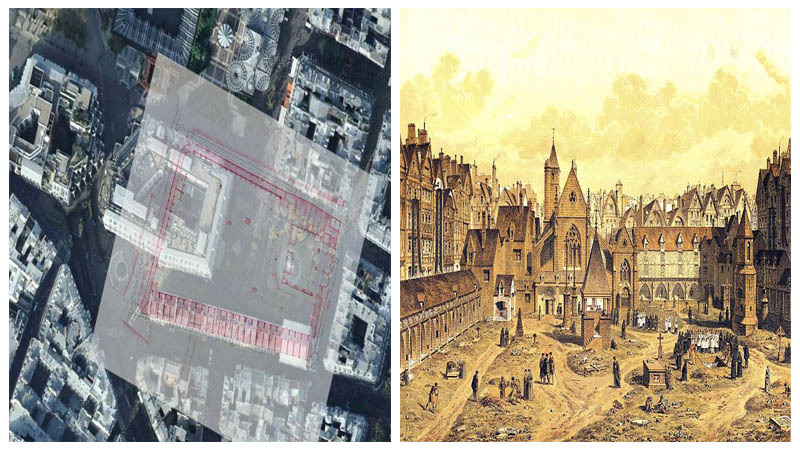 In order to understand its story, we need to travel back to 12th-century Paris. 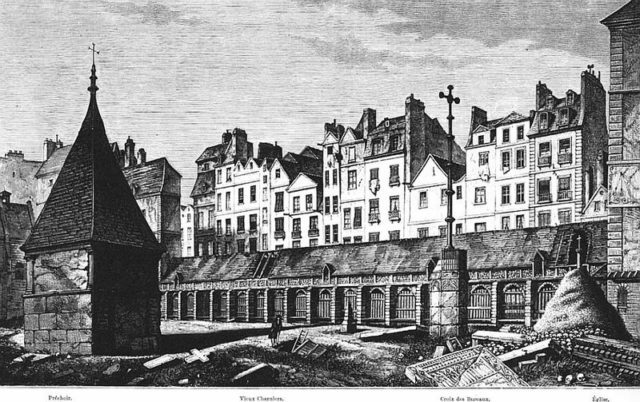 Back then, the location was called “Champeaux” and served as a burial ground with a small church and a fountain within its vicinity. The death toll back then was significantly larger due to many different factors, and the size of the burial ground grew fairly fast. Once Philip II of France came to the throne, the burial ground was encircled by a tall wall. Historical records show that this wall towered ten feet over the surrounding graves. The burial ground received the name “Les Innocents” and became an official cemetery. With this enlargement, the fountain was also encircled by the walls and became part of the cemetery. Many people from all walks of life got buried at the site. Those who could afford a burial spot erected lavish mausoleums and family crypts; others who were less fortunate got thrown into a burial pit. 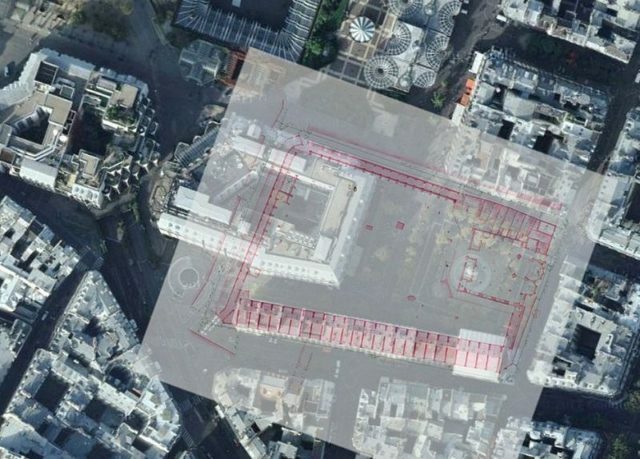 According to researchers, these pits could fit anywhere between 1,200 and 1,500 dead bodies. Investigations have revealed that the bodies were not lowered gently into the pits but were instead dumped without a particular order and rather chaotically. Once the pit got packed with dead bodies it was closed; but until then, the bodies were simply left to decompose and rot under the elements – an act which presented a rather serious threat to public health. And then, tragedy struck. Paris got hit by the Black Death, which caused the death of millions of people across Eurasia and Europe. With this, the number of dead bodies within Les Innocents grew significantly. However, this wasn’t the only time Paris got hit by deadly disease. 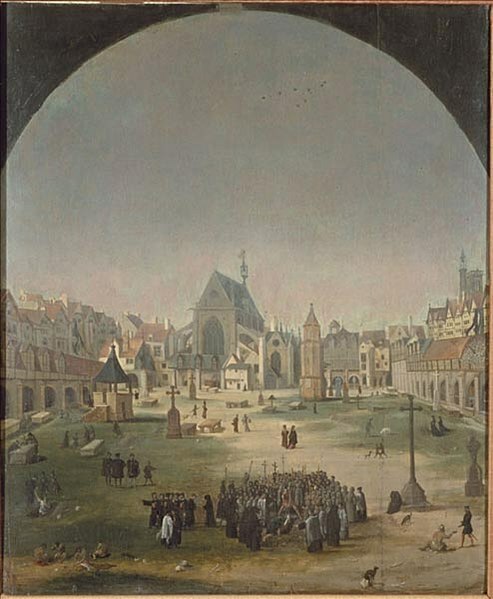 During the 13th and 14th centuries, France’s capital was ravaged by three different deadly plagues – each bringing countless bodies to the Holy Innocents’ Cemetery. With time, the stench of decomposing bodies became unbearable and local perfume shops and other businesses were forced to close down and relocate. The worst of it was felt in the local marketplace Les Halles. Merchants had to put up with the oppressive odor all day long. 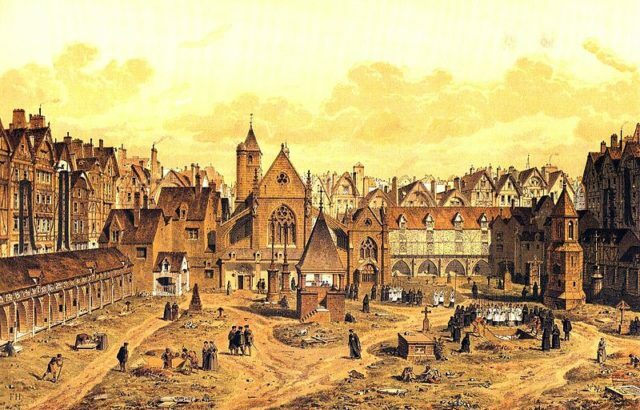 By 1780, The Holy Innocents’ Cemetery had reached its peak. After six hundred years of ceaseless operating, Les Innocents held no less than 2 million bodies. The official decision to shut it down came on September 4th, 1780. That day, heavy rain had hit Paris. The torrential flood mixed with the weight of dead bodies destroyed the basement wall of a house that was erected in parallel with the wall of the cemetery. Hundreds of bodies filled the basement. After the incident, the authorities came up with a new law stating that burials within city walls were to be strictly forbidden. 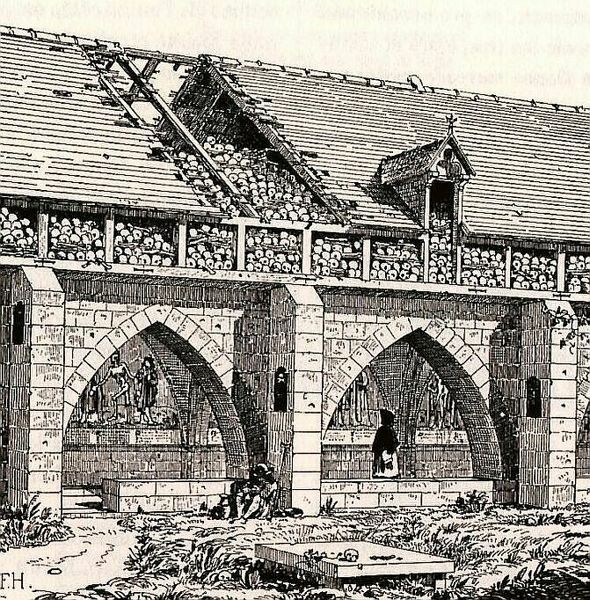 The dead from Holy Innocents’ Cemetery were exhumed and taken to what is now known as the Paris Catacombs, which back then was outside of Paris and today is a rather famous tourist attraction. 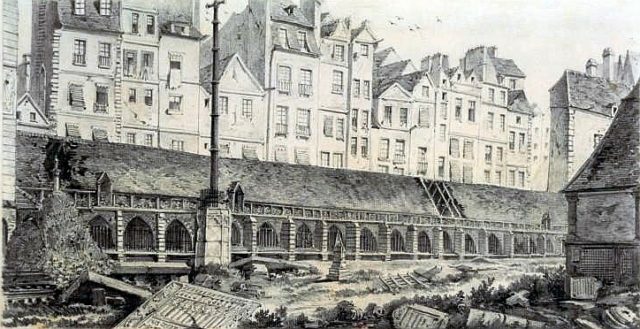 The site of the cemetery became a vegetable market. 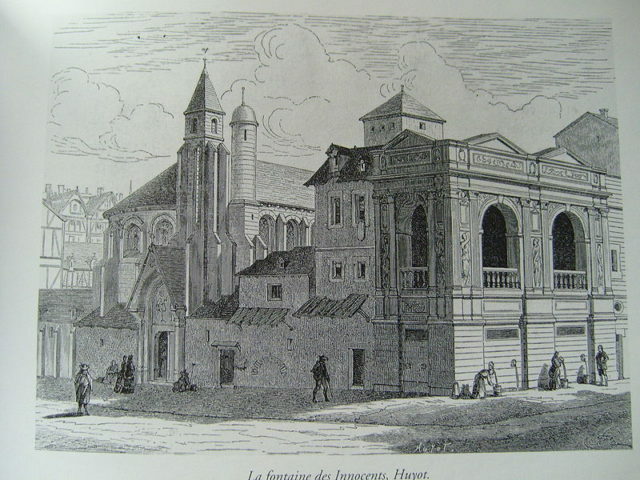 The church was destroyed but the Fountain of Innocents survived. Today, the location is a lovely square filled with Parisian bistros and cafés. The hubbub of people going about their lives mingles with the gentle sound of the fountain, reminding people of times past.